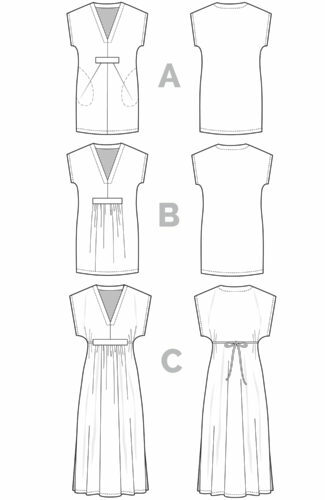 Learn the ins and outs of sewing a beautiful garment from scratch with our obsessively in-depth video tutorials. 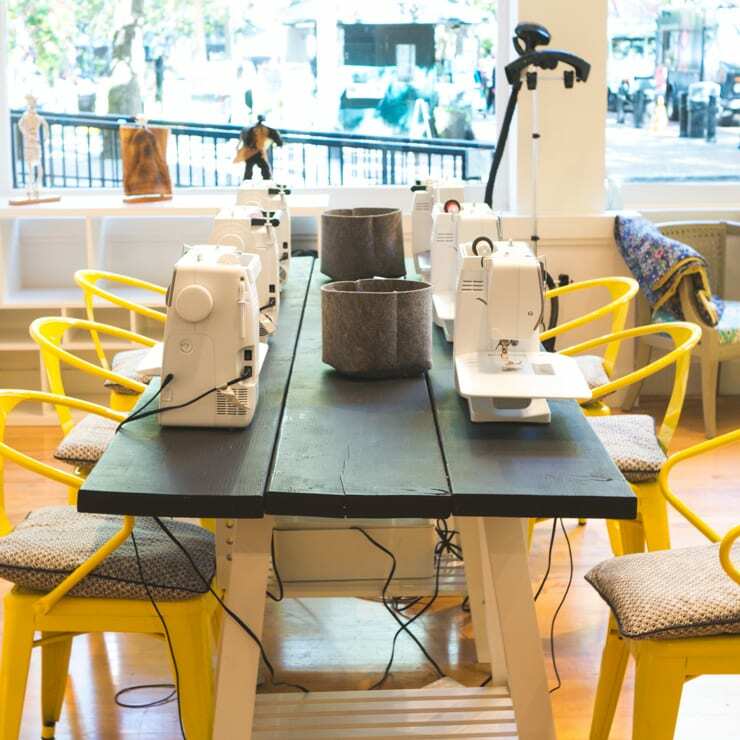 Discover if Heather is teaching a workshop at a sewing studio in your city. 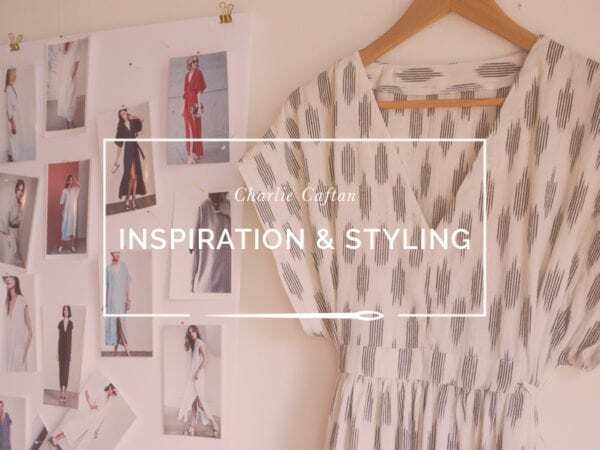 Musings from the cutting edge of style and sewing. 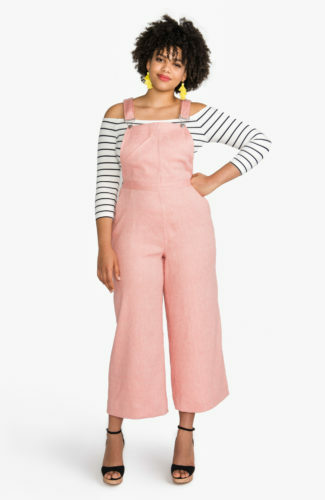 An inside look at my personal collection of modern essentials, stitched with love by yours truly. 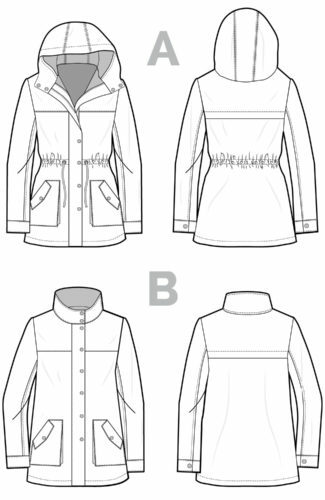 Download free sewing patterns and resources, and learn techniques to take your sewing to the next level. 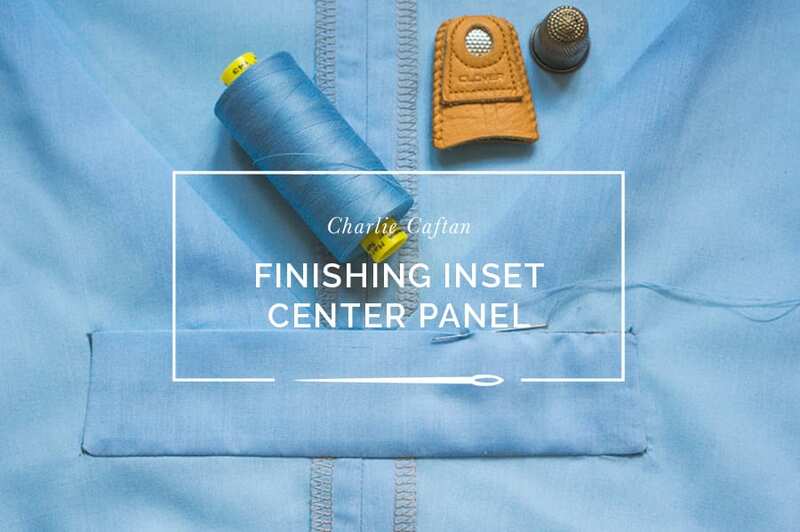 Last week we walked you through sewing the inset panel of your Charlie Caftan; today we’ll focus on beautifully finishing the panel on the inside of the dress. There are two methods for this step. 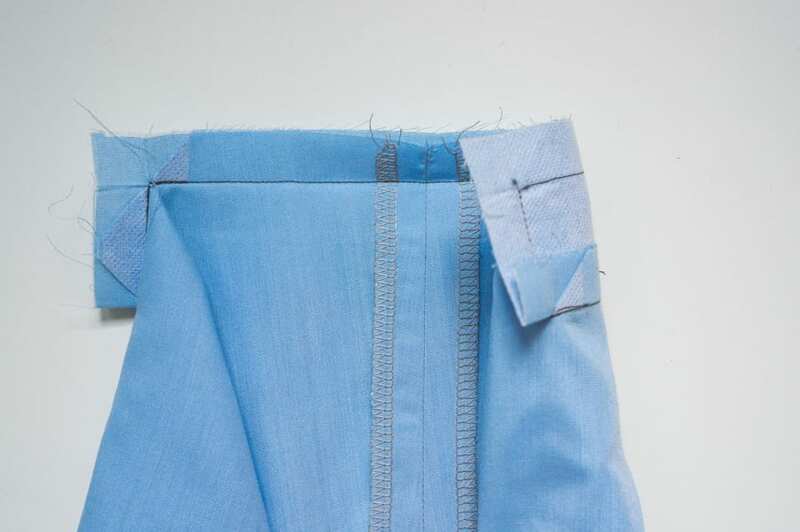 If you’re someone who enjoys hand-sewing, you’ll start by pressing the seam allowances around the perimeter of your completed bodice panel inwards. Here, I pressed the small sides in first before folding the long sides inwards. 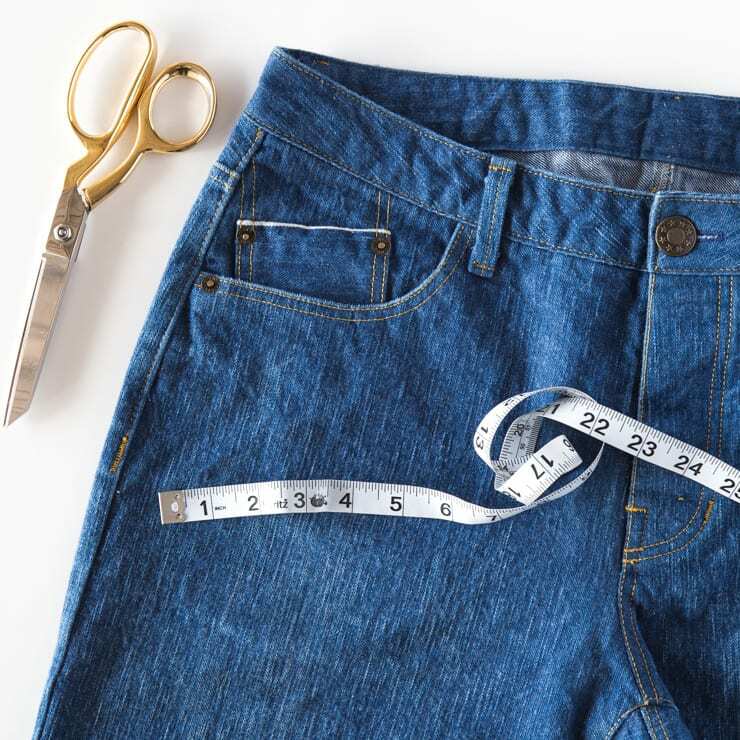 You’ll want to grade your seams too to reduce as much bulk as possible. 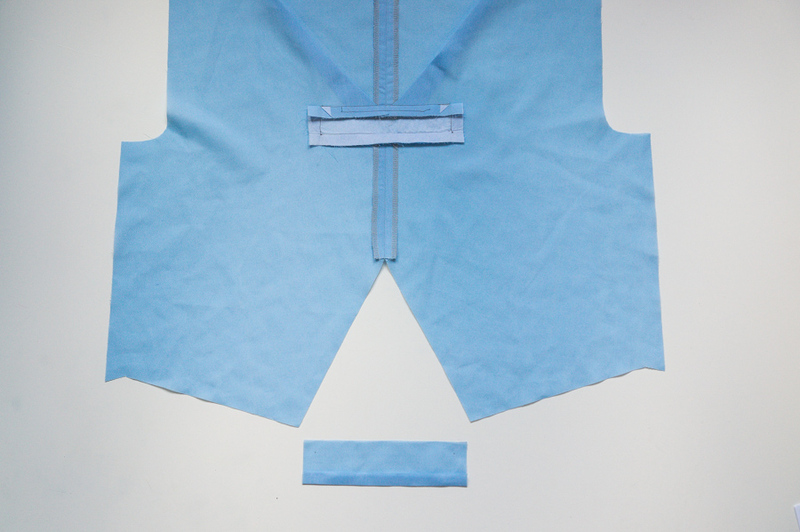 Now take the other (non-interfaced) bodice panel piece, and fold in the edges along the 5/8″ seam allowance. 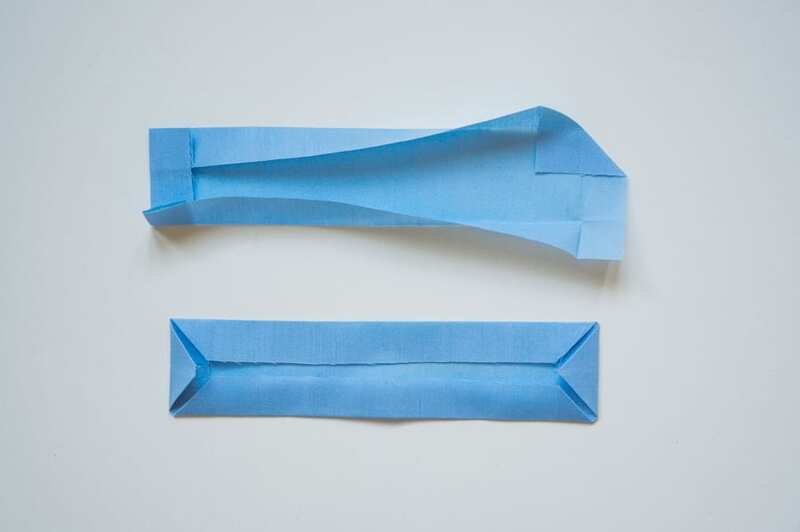 To make pretty mitred corners, press all sides in, then unfold and tuck each corner in before folding the sides back down and pressing once again. 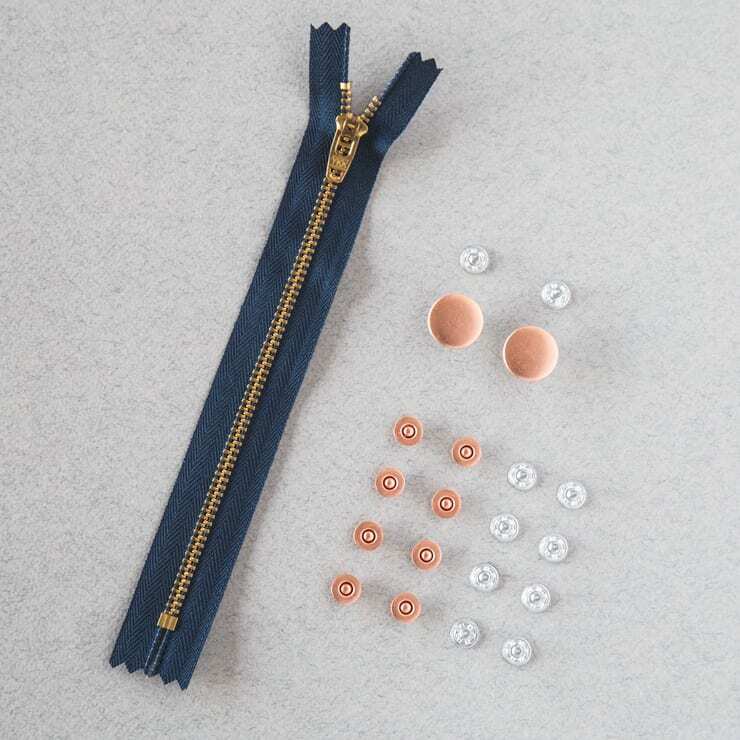 Pin the panel in place, and then relax while you enjoy slip-stitching that panel in place along all four edges with some matching thread. 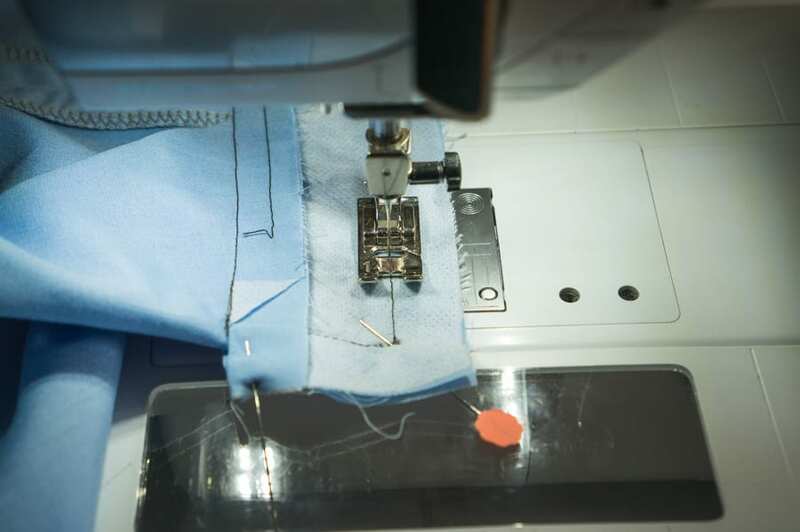 For those of you who avoid hand sewing at all costs, we have a second method that machine stitches the inner panel to the bodice along three of its sides. 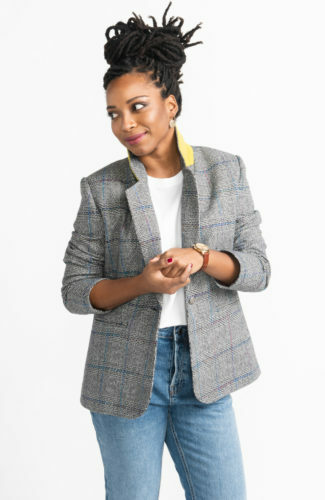 There is still bit of hand sewing but you can do this queen. 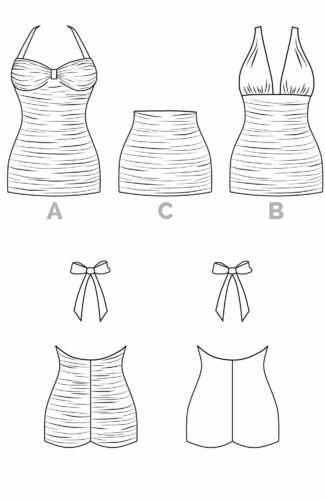 To start, press the bottom seam allowance of your inserted (interfaced) bodice panel and opening inwards, up towards the V neckline. 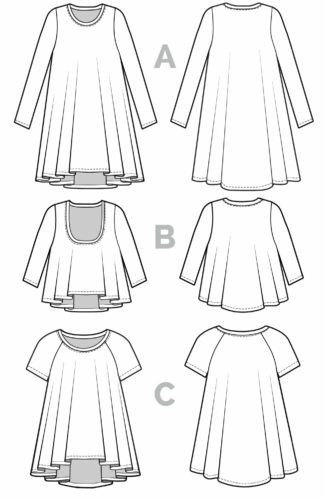 Take your non-interfaced bodice panel and fold and press one long edge in, wrong sides together along the 5/8″ seam allowance. 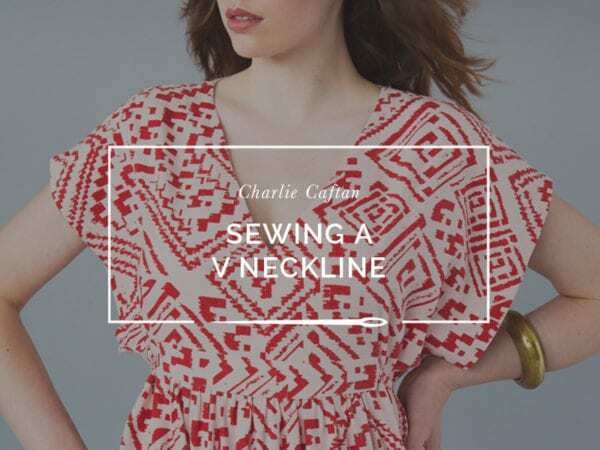 Position your front bodice piece right side down, with the V neckline towards you. Now hold the top edge of the inserted (interfaced) bodice panel and flip the rest of the front bodice down and away. 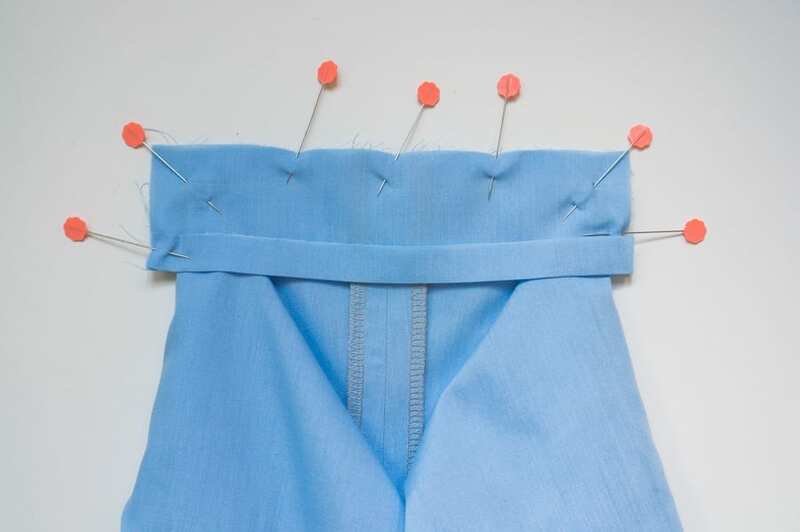 Take the non-interfaced panel and lay it on top, sandwiching the bodice between the two panel pieces, and pin along the sides. 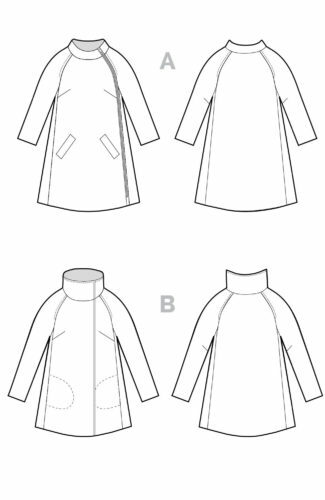 We’re going to sew along the three sides you see here. 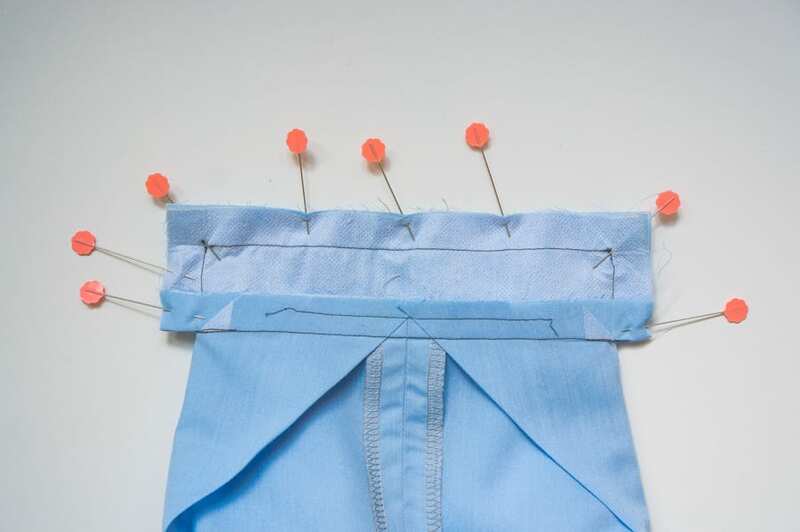 Make sure the pleated or gathered section of the bodice is tucked away, outside of your stitch line. This is what you’ll see from the other side. 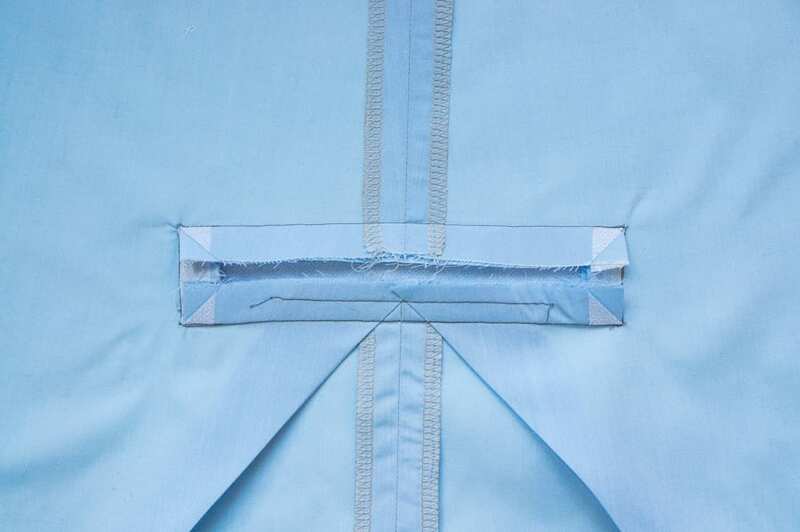 It’s best to sew the three sides from the side of the interfaced panel, so you can use the existing stitch lines as a guide. 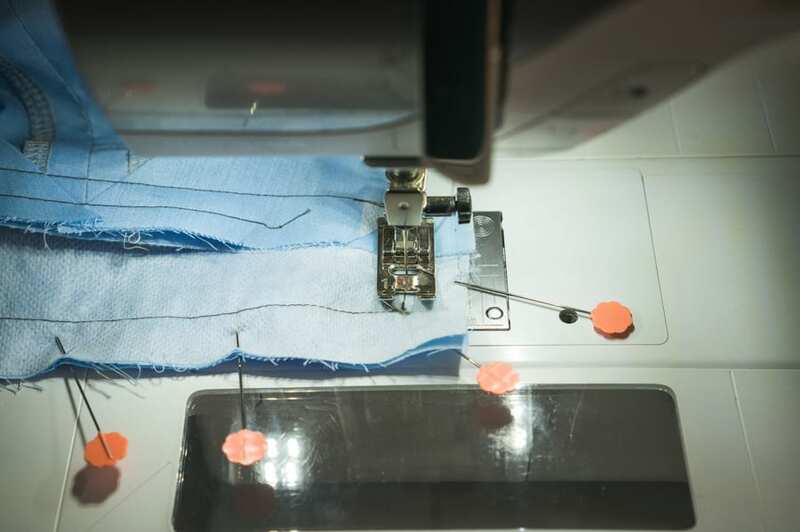 Stitch along all three sides, keeping your needle down so you can turn the corners accurately. 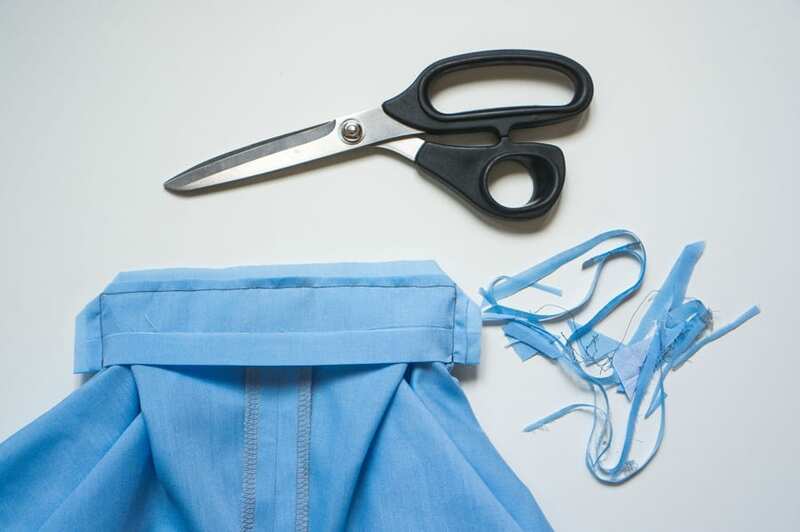 Make sure that none of the bodice fabric has been caught in your stitching. You can flip everything right side out to make sure your perfect 90-degree corners are still intact. 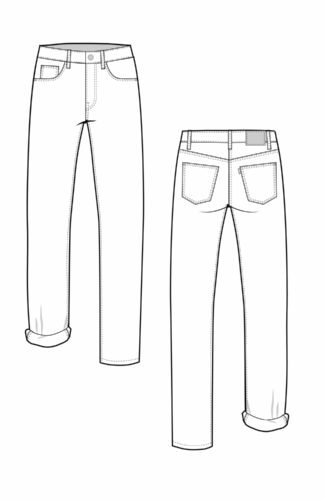 If everything looks ok on the right side, you are ready to trim and grade your seams and flip everything to the right side. 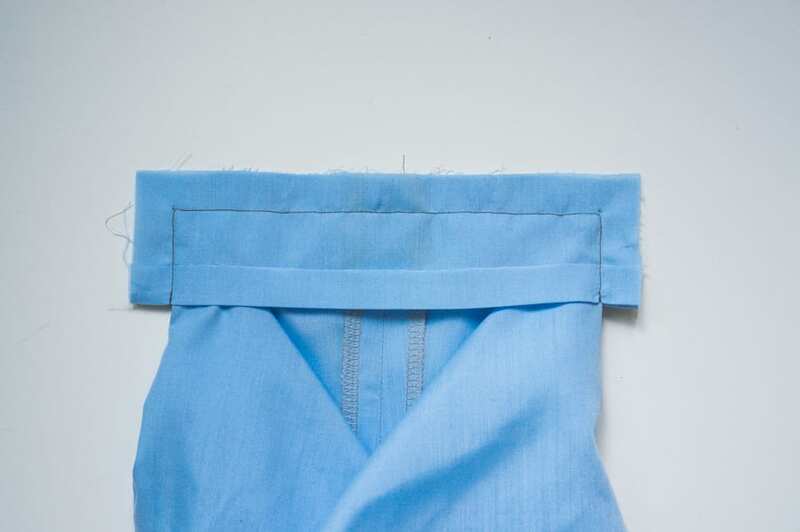 Trim the corners at 45 degrees, without cutting into your stitching, to reduce bulk. 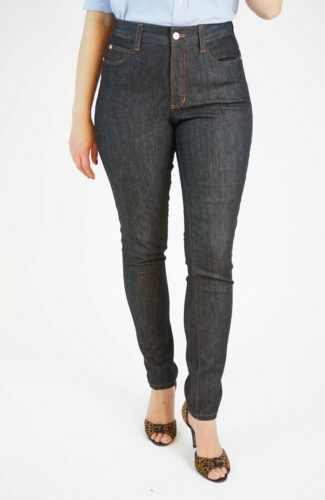 Turn the little pocket you created right side out, and poke the corners with a point turner to sharpen your angles. 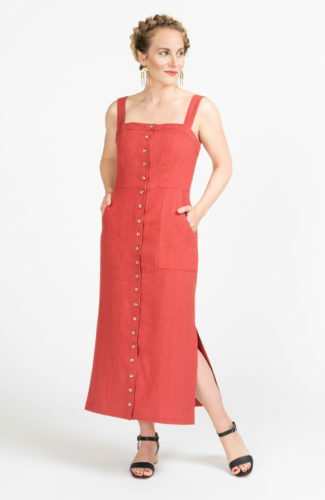 You still have a little bit of hand-stitching to do with this method, but it will be worth it! 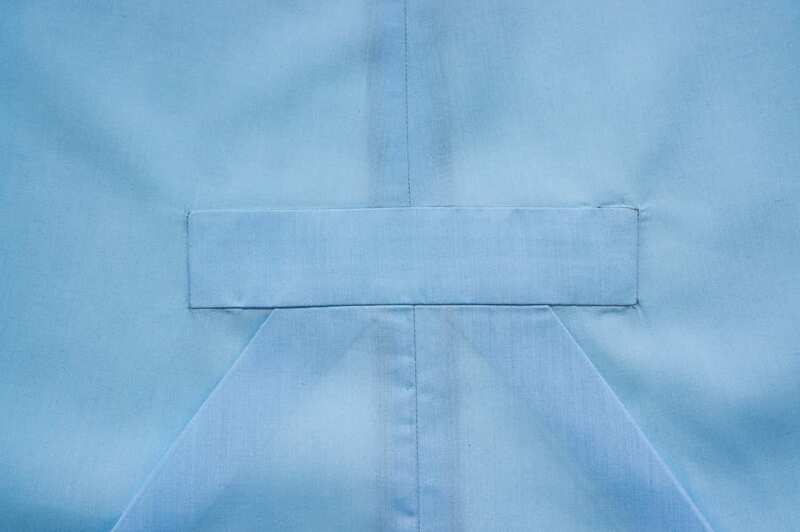 The panel seams should be perfectly hidden, from the front and the back! 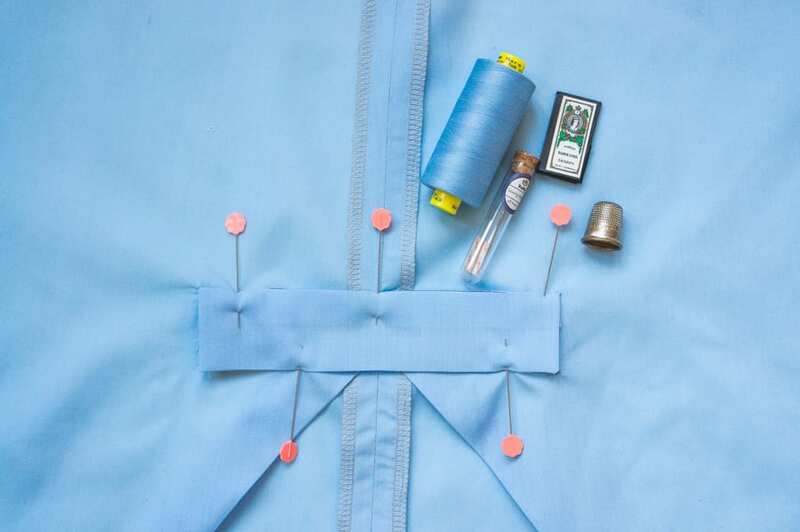 Now that the center panel is sewn, you can proceed with the rest of the caftan construction. 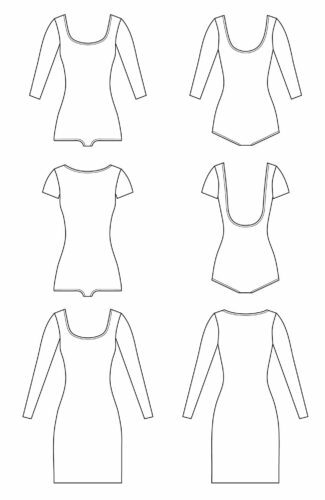 I’ll be following up with a post on tips for sewing the V neckline, but don’t hesitate to let me know if anything else is confusing! 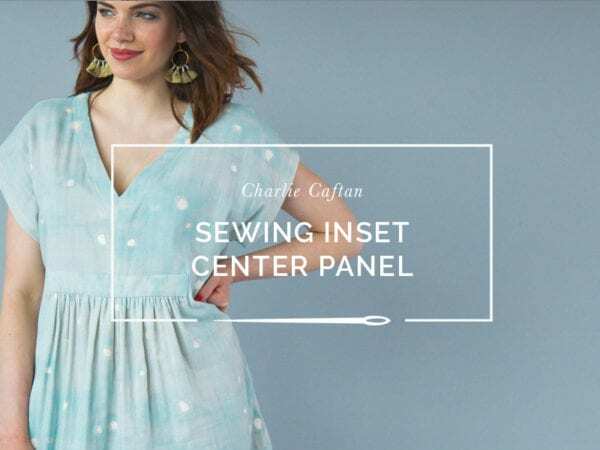 Sign up for a bi-monthly dose of indispensable sewing inspiration and know-how sent straight to your inbox, and be the first to know about new patterns, sales and events. 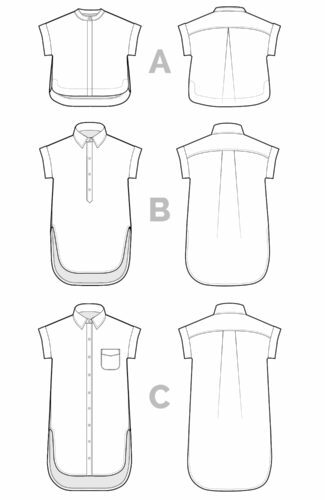 We'll also send you members-only access to our Sewing Resource Library, filled with free patterns, fitting ebooks and downloadable goodies! 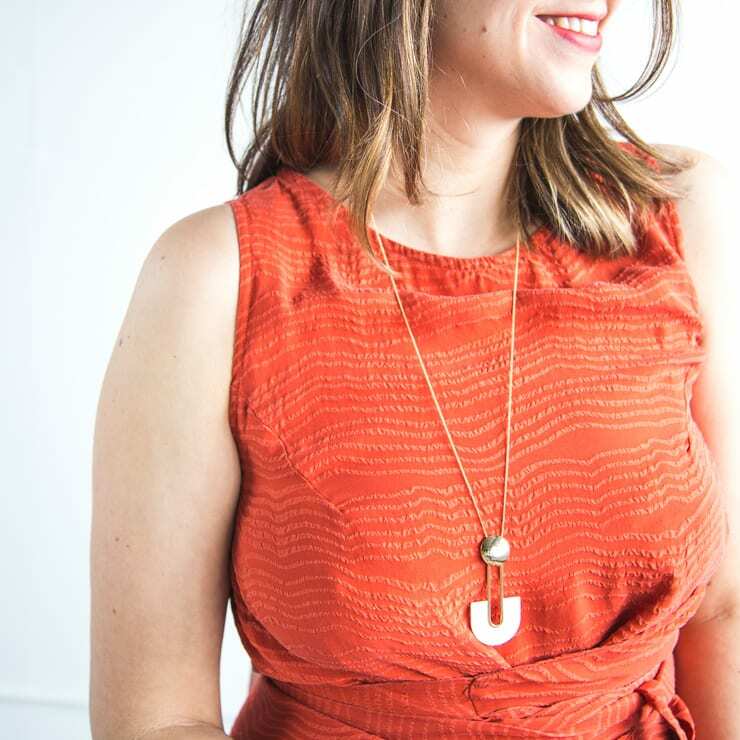 I'm a pattern designer, blogger, and sewing educator for the modern maker. 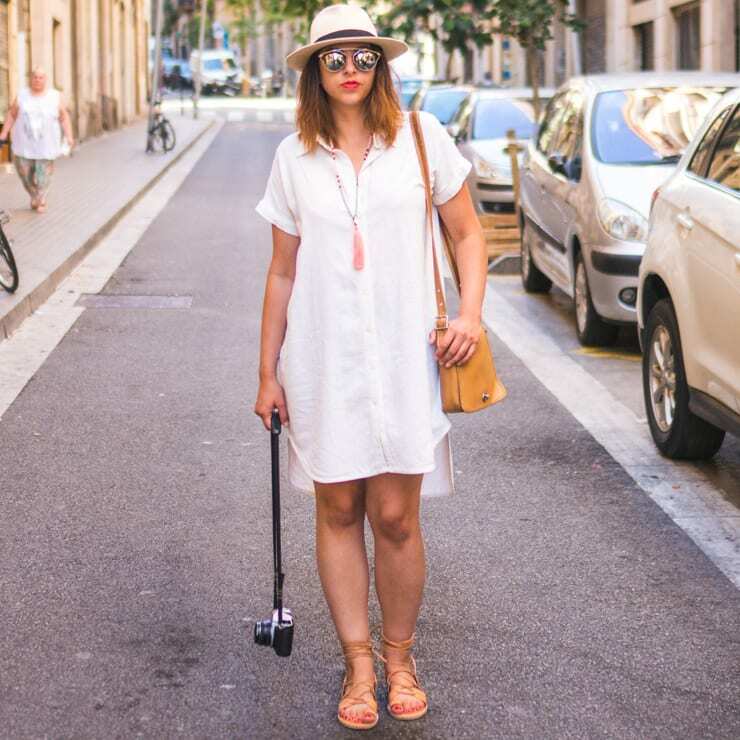 I transform your imagination into step-by-step implementation that helps you build a wardrobe you love -- not one you're limited to buying off the rack. 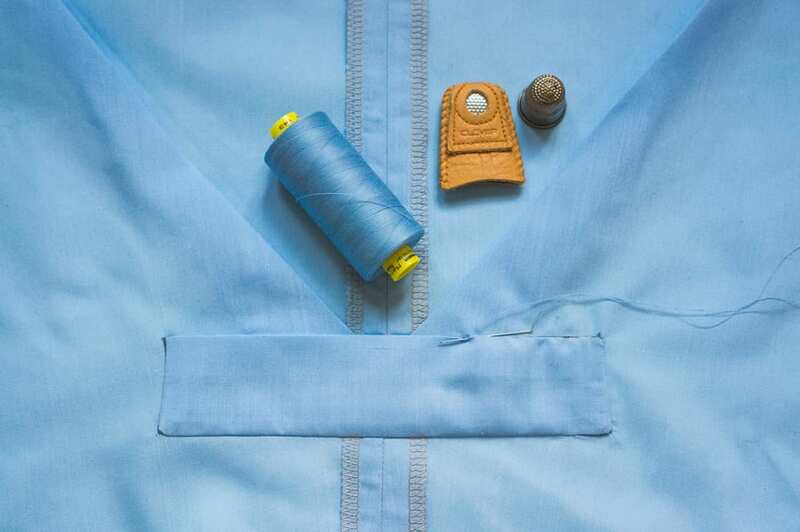 We send indispensable sewing goodness to your inbox twice a month. 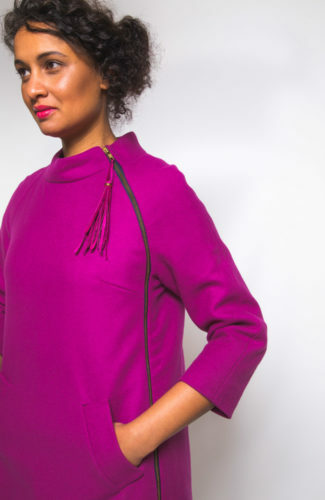 Plus, get members-only access to free patterns & ebooks when you sign up! 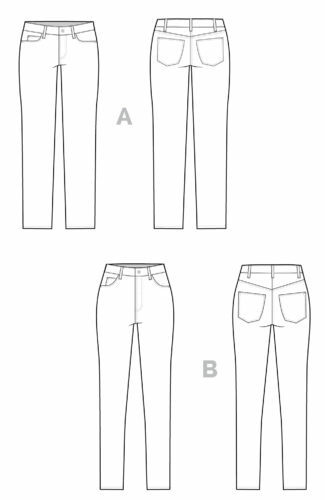 Jean Fitting Adjustments for Your Best Fitting Jeans! I will occasionally include affiliate links in my posts; this means I make a small commission whenever items are purchased. I only ever recommend products that I think are awesome. You can read more about my advertising policy here. 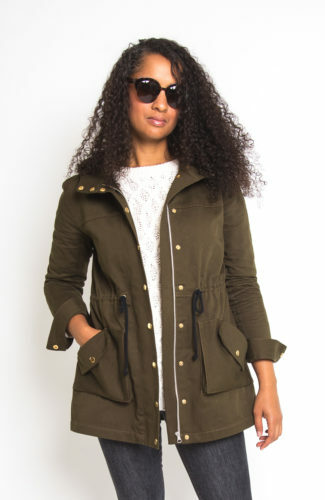 We send indispensable sewing goodness to your inbox twice a month. Plus, get a free PDF gift when you sign up!